Will Hillary Clinton’s evolving views on legalizing gay marriage hurt her presidential prospects? Probably not. Clinton is taking heat for her “contentious” and “testy” exchange with NPR host Terry Gross yesterday regarding her evolving support for legalizing gay marriage. Clinton’s appearance was part of her national book tour touting her new memoir, Hard Choices which chronicles her four years as Secretary of State. Many pundits see the book tour as a pretest of her 2016 presidential campaign, and thus are using it as a barometer of how well prepared she is to make a second run for the nation’s highest office. Based on the reaction by pundits to the interview, they do not believe she’s yet battle ready. Critics suggest that in response to Gross’ probing questions Clinton failed to adequately explain when and why her views on the issue of gay marriage changed – was it a case of political opportunism? – and that the exchange made her sound angry and thin-skinned (read: “unpresidential”), proving once again that Clinton is “not very adept” in these more intimate formats. This CNN post-mortem is not atypical of the pundits’ reaction. (I’ll leave to you to decide whether the exchange with Gross is “testy”.) Instead, it appears that her attitude on the topic has evolved almost in lockstep with those of most Americans. To see how, compare the Washington Post’s timeline of Clinton’s public statements on the issue with the attitudes of Americans on this topic more generally, as captured in survey data. 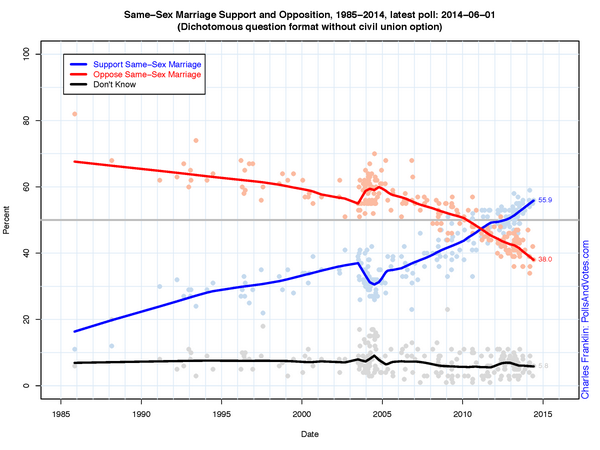 As Clinton alludes to in the interview, when her husband signed the Defense of Marriage Act (DOMA) into law in September, 1996, support for gay marriage was quite low. 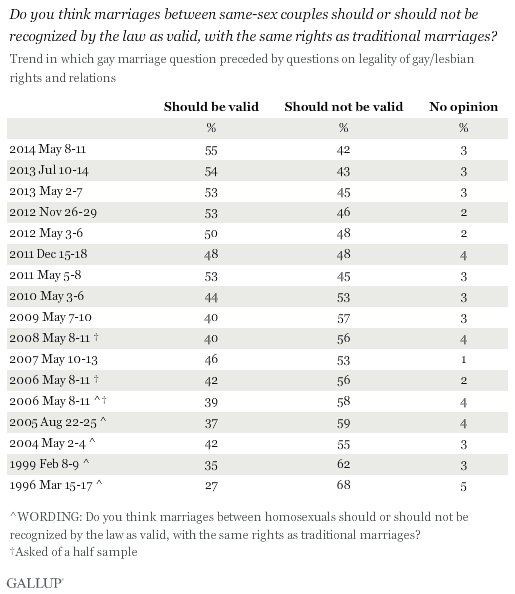 Not surprisingly, Clinton does not appear to support legalized gay marriage at that time. Since then, support has grown among almost all demographic groups, so that today a majority of Americans support the legalization of gay marriage – as does Clinton. Moreover, this increase in support has continued into 2014 and shows no signs of abating. My point here is not to defend (or condemn) Clinton’s evolving attitude toward gay marriage. Clearly she was not in the vanguard of the movement toward marriage equality – something she openly acknowledges in the NPR interview. Most of us who change (grow?) individually do not have to worry that this process will take place publicly, with every statement taken down and potentially used against us as a sign of moral weakness and/or political opportunism. Presidential candidates, however, do not have that luxury. Everything they say can, and will be, used against them by somebody. It is probable, of course, that the issue will have greater salience among the party activists participating in the Democratic presidential nominating process, but even among this important subgroup I do not believe candidates’ evolving attitudes on gay marriage will be the deciding issue. In short, while the NPR crowd may get fired up by Clinton’s “testy exchange” with Gross, I suspect it will have little impact on her presidential fortunes.